opportunity to get in touch with a wide range of enthusiasts. not available to others, please let me know). 2. Your location (city/state/providence,etc. in which the game is located). 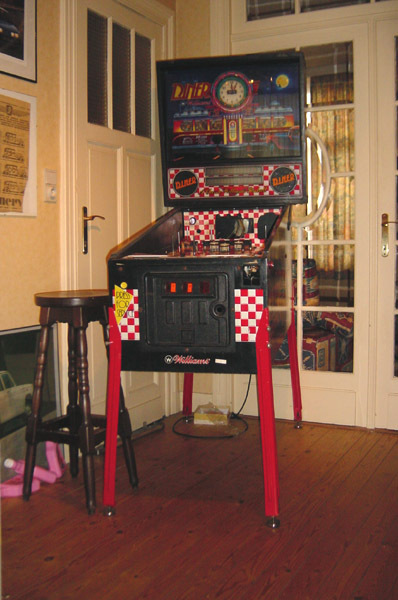 there you can often acquire it on the inside of the coindoor / front of the playfield). usually on the back of the cabinet). 1 Chris Bucci Erie, PA 06/11/90 571 42024 Early production model with Diamondplate playfield. Currently being clear-coated and restored. "Hey....get the lead out!" 2 Ben Faber Phoenix, AZ 6/21/90 571 I426201 Sample game with Diamondplate playfield. 3 Johan Miguet Antwerp, Belgium, EU 6/25/90 571 1426059 Rescued from a shed in 2004. in reasonably state, but needs lots of work. restoring it for the moment. 3 Frank Burgoon Pittsburgh, PA N/A 571 420910 This is my only pinball. I have owned it since the summer of 2004. In the early 80's I owned a Gottlieb Soccer. 4 Steve S. Shelby Township, MI N/A 571 420096 This one is a sample with the diamond plated playfield. It's currently being stripped and getting sent out for clear-coating.